Using the multiple clipboard is really easy to use, on all Windows (10, 8.1, 7, ... ) after you have downloaded the freeware program. Please start the program MultiClipBoardSlots by default 5 clipboard slots are predefined. The Windows clipboard can be extended with this program up to 10 extra memory clipboard memory slots. CTRL + C for copy move the copy of the selected objects (text, image, files, ... etc) into the clipboard. CTRL + V to paste into another program. CTRL + 1 to put the marked objects in the clipboard ergo copy command. ATL + 1 for paste into another program. 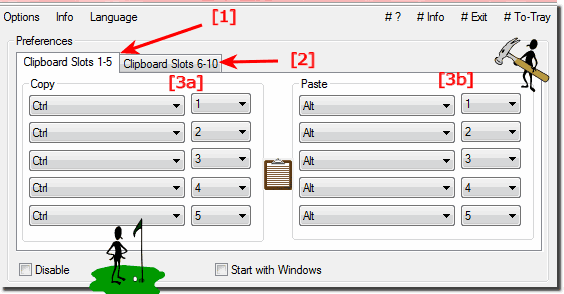 If you want to put something in clipboard slot 1 now use CTRL + 1 to copy and ALT + 1 to paste. (... see Image-1 Point 3a and 3b). The function is the same only if you need the clipboard at a later time you can continue to use the standard Windows clipboard without that in the clipboard slot 1 will be overwritten. The same is at the other 10 clipboard places (memory). The keyboard layout for these are freely adjustable. And can be changed at any time. Without overwriting them by pressing the standard Windows clipboard keys. (Image-1) Additional clipboard for Windows 10 to XP! MultiClipBoardSlots - FAQ-5: How to use MultiClipBoardSlots for Windows, help? How do you use this program MultiClipBoardSlots? I don't see a Help file or tutorial? Hello, Can you give an example of how to actually use the program or, tell me what I'm doing wrong? I opened Notepad, typed "Hello", then selected it, opened MCBS1.23, hit key Ctrl+2, then Alt+2. Nothing happened in Notepad. I was doing the simplest thing I could think of to copy and paste. Thanks for any help you can give me, as I think it's a useful tool! Using this tool the best Clipboard managers for Windows 10 allows you to easily the data you copied to 10 Clipboards! Pasting multiple things from clipboard in Windows 10 / 8.1? Windows 10 Forums - How to add a new Clipboard to Windows 10? Win 10 operating systems have a buffer for 1 item in the clipboard how to extend it? Store Multiple Items to Clipboard in Windows, How-To? Windows 10 multiple for the screenshots and images? Free program enhance Windows clipboard download? MCBS saves each item placed on the clipboard free software to allowing you access to any of those items images, office text at a later time. ?